What are the Best Nylon-Stringed Classical Guitars for Beginners? We checked through our article highlighting some of the best classical guitars for beginners, and didn͛t want to remove anything – these guitars remain as awesome as when we first wrote the chart! However, we added the popular Fender MC-1 to offer another affordable option for beginners. How Much Should I Pay for a Beginner Classical Guitar? What is The Easiest Type of Classical Guitar to Play? What to Look for in a Beginner Classical Guitar? Do I Go For a Used or New Guitar? What Do You Need to Play Classical Guitar? Buying a Classical Guitar for a Child? Starting out in the world of guitar? This is the page for you, considering that the majority of guitarists will learn their first notes, scales, chords and songs on a nylon-stringed classical guitar. The reason is simple – it tends to be an easier platform on which to learn. Everything is spaced out nicely, the nylon strings aren’t as harsh on beginner fingers, and there is nothing complicated to get to grips with – no electronics, controls, or moving parts. Classical guitars are also slightly cheaper than their steel-stringed counterparts. Aside from general beginners, a classical guitar is also essential for those guitarists wanting to play certain styles of music – be it Latin, classical, flamenco, fingerstyle, or jazz. To help you with your hunt for a quality instrument, we’ve searched the current market for the very best classical guitars and for those suitable for beginners. Be warned, we are focusing on beginner-friendly guitars here, not price. Therefore, this is not a list of cheap guitars – although we do have a page dedicated to budget classical models. Epiphone extend their PRO-1 series into the classical market, with great results! A stylish electro-acoustic classical guitar with lots to offer beginners. A quality electro-acoustic classical guitar from Yamaha. Cordoba’s Protege line impresses with this affordable model, perfect for beginners. The C5 sets the bar high for affordable classical guitars. Nice sound and solid construction make this small guitar a winner. Another fantastic flamenco model with real style. Think you can’t get an innovative beginner’s model on a budget? Think again! As part of Epiphone’s celebrated PRO-1 series, the PRO-1 Classic brings a host of quality components to the world of classical guitar. The highlights of the PRO-1 Classic – as we mention in our full review – include the slightly reduced scale length body (even though it remains full-size, it’s about an inch shorter), a slim EZ-Profile neck and a PRO-Ease coated rosewood fretboard, which all combine to deliver a much easier playing experience for beginners. The tone on offer is very good too, thanks to the solid cedar top and mahogany back and sides. All in all, the PRO-1 Classic is a good-looking and fast-playing guitar, tailored specifically to beginners. While the slimline body and the black color-scheme of this Ibanez doesn’t exactly scream ‘tradition’, this model certainly has plenty to offer the beginner guitarist – as we highlight in our full review of the AEG10NII. The classical guitar features a thin body making it comfortable to hold, while a deep cutaway allows easy playing of the highest frets. The satin-finished mahogany neck is also an excellent feature and a joy to play. 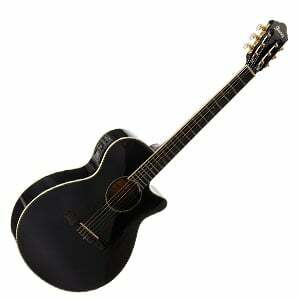 The tonewoods are very good too, with a spruce top, and mahogany back and sides that make for a well-balanced sound. This is an electro-acoustic classical guitar, and therefore features electronics – Ibanez’s versatile AEQ-SP1 preamp, with a Fishman Sonicore pickup, solid controls, and a handy built-in tuner. Very good. The slim nato neck almost feels like a steel-string guitar to play – very fast and comfortable. This electro-acoustic model is stage-ready and features Yamaha’s ART pickup system, with good volume and tone controls for lots of versatility, whatever your style. Acoustically it is warm and resonant, even with its reduced size, while playing through pickups it sounds fantastic – especially when combined with an acoustic amplifier from this list. This impressive full-sized C1 from Cordoba’s wallet-friendly Protege line combines great style, sound and value, and proves a solid choice for any beginner. With a traditional non-cutaway body shape, the top is made from laminated spruce with fan bracing, with the back and sides crafted from mahogany, all featuring a high-gloss polyurethane finish. There is also a mahogany neck with a rosewood fretboard and 19 frets. In all it’s a very playable guitar and, even though it comes from Cordoba’s Chinese workshop, it shows off good craftsmanship. As we mention in our full review of the Protege C1, the sound is more than suitable for any beginner – well-balanced and articulate, with ample projection. As we move onto classical guitars, let’s begin with a beautiful model from Cordoba’s Iberia series. The C5 is a full-sized nylon string guitar, handmade in the traditional Spanish style, and both looks and sounds superb. There’s a solid Canadian cedar top, with laminated mahogany back and sides, finished in a natural high gloss. The neck is crafted from mahogany, with a rosewood fretboard and is thin and comfortable – a joy to play. The C5 – as we highlight in our full review – offers very good projection, thanks to the tonewoods and the fan bracing, and a warm, well-rounded tone that lends itself well to everything from classical music to jazz. This Portuguese-made jewel comes at a very affordable price and offers exceptional sound to beginners and advanced players alike. While the majority of guitars in this chart are full size, the Fender MC-1 makes use of a smaller ¾ size (a 23.3” scale length and a 1.69” nut width) – perfect for beginners and players with smaller hands, whatever your age. There’s nothing sensational about the design, but it’s still a good-looking instrument with a little elegance thanks to the satin finish and black binding. The woods are all laminated, as you’d expect at this price, with agathis on the top, and sapele back and sides. There’s a solid nato neck, with a rosewood fretboard and 18 frets. As for sound, it’s quite impressive for such a small size – crisp and mellow. Check out our complete Fender MC-1 review here for more praise! Another awesome flamenco guitar to add to the list, this time from Yamaha – the kings of quality on a budget. This excellent CG127SF – reviewed in full here – provides the flamenco-style look and tones on offer from more expensive models at an affordable price, that would suit any beginner. It’s sleek and stylish, with a solid European spruce top accompanied by a cypress back and sides. It also features a very playable nato neck – which is slightly wider than usual – and a rosewood fretboard. The body also sports transparent flamenco scratch plates to protect the wood, which is a nice touch. It sounds bright and resonant, with natural flamenco tones, although would work well with many other styles. A great question…. and one we can’t answer. Although we can certainly give you some advice! Firstly, you need to define what the guitar will be used for. If you’re a complete beginner and are unsure whether you will persist with learning the guitar, then you may want to side with a cheaper instrument – after all, if you don’t progress as planned or give up early, then you can sell or give it away without feeling you’ve wasted a lot of money. However, you may feel that playing the guitar is definitely something you’ll persist with. In that case, our advice is simple: buy in the highest price range you can afford. Naturally there’s no need to drop $2,000 on a Kremona Solea, but purchasing something a little more expensive can result in a lot more playability and durability, which will last you a lot longer. It’s also a better incentive to practice. Practicing on an instrument that feels good quality and fun to play is more likely to encourage you to sit down and put in the hard hours that learning the guitar takes. Classical guitars tend to come in two styles – traditional classical and flamenco. Both are easy for beginners to play, although which you go for will depend on the style of music you want to learn. For the record, a flamenco guitar tends to be a little faster to play because it has a lower action (where the strings are lower to the fretboard), although – unless you are going to learn flamenco – it is advisable to stick with a traditional classical guitar. This isn’t a disadvantage for beginners, as all classical guitars are relatively simple to get to grips with, as their nylon strings are easier on beginner fingers, plus the neck is slightly shorter than an electric or steel-string acoustic guitar. Ultimately the quality of the guitar plays a part in the ease of play. You will find that a more expensive guitar is usually better made, with a smoother neck and better dressed frets. This all contributes to an easier playing experience. First and foremost, playability. Usually we would say it depends on the tone and style you prefer, but when it comes to a beginner model, playability is paramount. You want something that will play smoothly and easily, not something you have to battle with to make a note sound. Of course, having a decent sound will also be important. Unlike an electric guitar, where pickups and amplifiers tend to determine the final sound, a classical guitar’s tone will be solely down to the woods used and its construction. For example, spruce offers a bright and vibrant tone; cedar is sweet and warm; while mahogany is warm but woody. As we say, it’s not worth getting too caught up with tonal specifics at this stage – as long as the guitar is articulate and offers a decent projection, you’ll be winning. One thing worth keeping an eye on is the hardware. Again, compared to electric or electro-acoustic guitars, classical guitars are relatively simple when it comes to hardware. But simple shouldn’t mean poor quality. A rosewood bridge should be standard, and the nuts and saddle should be bone or a synthetic material, not plastic (the nut material will usually differ with the amount of cash you spend). However, Epiphone’s PRO-1 Classic Acoustic Guitar at under $100 – a beginner’s guitar that’s swimming in innovative hardware – is proof that you don’t need to spend over the odds for decent hardware. Although in general you will find that the more expensive the guitar, the better the standard of hardware, and you should start seeing better components such as more precise tuners and even hard-shell cases coming shipped as standard. Some guitarists argue that a second-hand guitar will actually sound better than a brand-new model, as the wood gets ‘broken in’ and matures (like a fine wine!). Buying used is also good for value-for-money, as you’d expect. A $1,500 Cordoba for $900? Yes please! If buying used is something you want to explore, make sure to stick to reputable online or physical guitar stores. Don’t be tempted to buy from a flea market or thrift store, as you open yourself to all sorts of risk. On the other hand, nothing beats that new guitar feeling! Buying a brand-new guitar gives you that fresh from the box condition, the delicious smell of the new wood, and the knowledge that you were the first to play it (i.e. nobody has dropped it or tinkered with it). Plus, you have the added security of a warranty/returns policy if you aren’t happy with the guitar or something goes wrong. 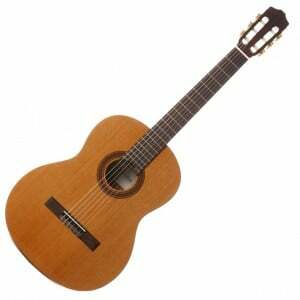 After purchasing a classical guitar, you won’t actually require any additional equipment to play it. However, there are some tools that may make it easier and more fun. To begin, either a case or gig bag to both store and transport to guitar in is a useful accessory to buy from day one. You don’t have to spend much on this case, but something with a little padding will go a long way to avoiding damage from bumps and scrapes when on the move. A digital tuner is also another sensible purchase, as you will find that nylon-stringed classical guitars can slip out of tune quite regularly. If you have bought an electro-classical (which has a pickup/preamp system), you will also need a cable and an amplifier if you want to use the guitar to its full potential. However, we recommend you avoid these guitars as a beginner because adding electronics adds unnecessary costs, while amplifying yourself as you learn chords and notes for the first time really isn’t required. Save amplification until you are at a level worthy of performance. The size of the child in question will depend on the size of the guitar you buy for them. Not all children will be able to cope with the bulk of a full-sized guitar (just as much as some adults may struggle with a ½ size model!). Generally, kids aged 2 to 5 will need a ¼ size guitar; 5 to 8 will use a ½ size guitar; and ages 8 to 12 will benefit from a ¾ size guitar. Unless they are particularly small, as soon as the child moves into their teens, a full-size model will usually be suitable. Be sure to check out our page dedicated to the best kid’s guitars on the market today. It’s down to you now. You now know that – for beginners – playability is more important than sound, buying used has its pros and cons, and paying a little more can result in an instrument that will last a lot longer. We suggest that you have a good browse of the models we’ve highlighted above, although we will emphasize that this is by no means a comprehensive list. There are hundreds of classical guitars out there that are suitable for beginners – these are just some of the best in our opinion. When you have the guitar it’s usually a good idea to change the strings, as factory strings (especially on cheaper models) don’t have the nicest sound and feel. Better yet, take your new purchase to your local guitar pro to set it up for you – for a small charge, the increase in playability will be more than worth it. When it comes to shopping around, find something that suits your budget, styles and aspirations. Watch videos, read reviews and if you can try it before you buy, all the better. Good luck! You call the Cordoba C5 a “Portuguese-made jewel”. But isn’t the C5 made in China like all of Cordoba’s budget models?